Learn the names of the twelve disciples and a few interesting facts about them in this coloring activity. This is part of a series called Bible Puzzle with a variety of different puzzles. Besides pencils, some need Bibles, crayons, and/or scissors and glue. Some are easier or harder than others. Jesus’ disciples were twelve men he picked to travel with him and learn from him. 1. 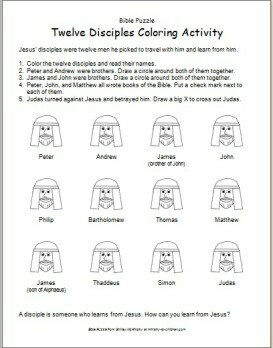 Color the twelve disciples and read their names. 2. Peter and Andrew were brothers. Draw a circle around both of them together. 3. James and John were brothers. Draw a circle around both of them together. 5. Judas turned against Jesus and betrayed him. Draw a big X to cross out Judas. A disciple is someone who learns from Jesus. How can you learn from Jesus? Tony Kummer (Editor) reviewed & updated this page on : March 26, 2019 at 11:36 am. All our content is peer reviewed by our readers, simply leave a comment on any post suggest an update.